Shirts With Random Triangles: Ohio State AD Gene Smith Plays Alan Iverson "Practice" Card In Opposition To Out-Of-State Spring Practice. 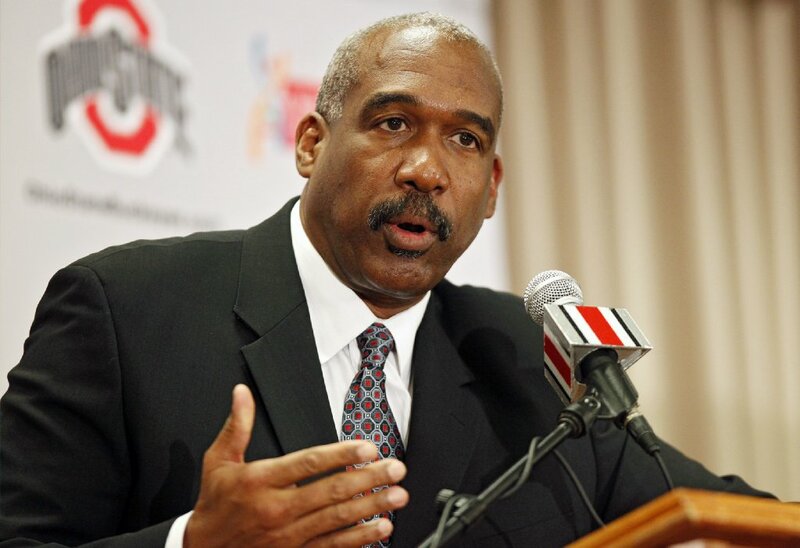 Ohio State AD Gene Smith Plays Alan Iverson "Practice" Card In Opposition To Out-Of-State Spring Practice. Ohio State athletic director Gene Smith has torn asunder any secret dreams of Buckeye head coach Urban Meyer emulating his Michigan counterpart Jim Harbaugh's holding spring practice sessions out-of-state. While Smith described Michigan's spring break jaunt to Florida as "a creative idea," he said that was not supportive of taking away student-athletes' free time to go practice." Smith managed to play the Alan Iverson card when it came to expressing concerns of spring practice sessions eating into player's spring break. "We're talking about spring practice. What's my man's name? Allen Iverson? We're talking about practice, man," Smith said. "So the reality is I wouldn't do that, I wouldn't support taking that time away from our student-athletes." Meyer tried to downplay the possibility of the Buckeyes holding out-of-state practice sessions last week. He did it in a "are you saying there's still a chance?" kind of way, however, saying "I can't see taking spring break away from players. That doesn't mean we don't research and keep an eye on it."